Link Group’s new ‘retirement living’ development at Abbey Place, Paisley has been officially opened by Renfrewshire Council’s Convener of Housing and Community Safety, Councillor Tommy Williams. 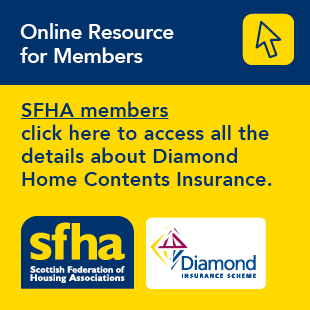 The £4.3 million construction of 38 ‘independent living’ homes, aimed at retirement living, for social rent and new supply shared equity commenced in March 2015 using £2.3 million funding from the Scottish Government. Built by Westpoint Construction, the 13 homes for social rent include one and two bedroom properties, three of which were designed to meet the needs of a wheelchair user. Twenty five of the homes were available to buy through the New Supply Shared Equity scheme, including one and two bedroom properties. Each property has gas central heating and hot water systems, high thermal insulation and double glazing to create warm, comfortable and energy efficient homes that will be easy and economical to run. The development offers additional resident facilities such as a fully furnished day lounge and en suite guest bedroom. There is also an area for storing and charging mobility scooters within the building. “I’m delighted to officially open this new development by Link, which has already delivered a number of landmark projects in Paisley town centre in recent years. “Our communities must have good quality affordable housing for people to rent and buy that helps to improve people’s quality of life, has a positive impact on health and wellbeing, and is crucial to achieving our priorities on regeneration, prosperity and economic growth. The last remaining properties available to buy in the block are valued at £110,000, with shared equity purchase prices between £45,100– £88,000 depending on the purchaser’s circumstances. For further information please contact Claire Simons on 01324 417 180. Pictured: Councillor Williams with Mr and Mrs Turner in their new home.